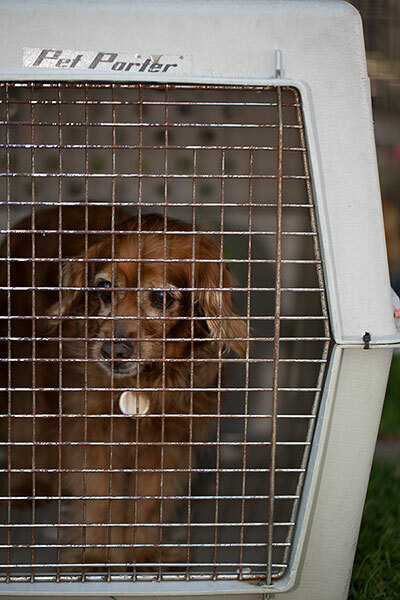 Puppy mills are a well-kept secret of the pet-trade industry. They supply animals to pet stores and purebred enthusiasts without any concern for the millions of animals who will die in animal shelters as a result. It’s standard practice for puppy mills to keep animals in cramped, crude, and filthy conditions without proper veterinary care or socialization. Puppy-mill kennels can consist of anything from small cages made of wood and wire mesh to tractor-trailer cabs or simply chains attached to trees, where mother dogs and puppies spend every day outdoors in the same small patch of dirt in all types of weather. Female dogs are bred over and over until they can no longer produce puppies – at which point they are auctioned off or killed. Mothers and their litters often suffer from malnutrition, exposure, and a lack of adequate veterinary care. Undercover investigations of puppy mills have revealed that dogs often had no bedding or protection from the cold or heat and no regular veterinary care even when they were ill. Health conditions such as crusty, oozing eyes, raging ear infections, mange that turned their skin into a mass of red scabs, and abscessed feet from the unforgiving wire floors all were ignored or inadequately treated. Investigators have observed dogs circling frantically in their small cages and pacing ceaselessly back and forth, oblivious to anything around them – their only way of coping with despair. Since puppy mills breed dogs for quantity, not quality, genetic defects are rampant. These can include physical problems that require costly veterinary treatment as well as personality disorders that often frustrate guardians into abandoning their dogs. With millions of unwanted dogs and cats (including purebreds) dying every year in animal shelters, there is simply no reason for animals to be bred and sold for the pet-shop trade. Without these stores, the financial incentive for puppy mills would disappear, and the suffering of these dogs would end. You can help. Always have your animal companions spayed or neutered and never buy from a breeder or pet shop.